In this section you'll add some classes for managing movies in a database. These classes will be the "model" part of the ASP.NET MVC application. You'll use a .NET Framework data-access technology known as the Entity Framework to define and work with these model classes. The Entity Framework (often referred to as EF) supports a development paradigm called Code First. Code First allows you to create model objects by writing simple classes. (These are also known as POCO classes, from "plain-old CLR objects.") You can then have the database created on the fly from your classes, which enables a very clean and rapid development workflow. We'll use the Movie class to represent movies in a database. Each instance of a Movie object will correspond to a row within a database table, and each property of the Movie class will map to a column in the table. The MovieDBContext class represents the Entity Framework movie database context, which handles fetching, storing, and updating Movie class instances in a database. The MovieDBContext derives from the DbContext base class provided by the Entity Framework. For more information about DbContext and DbSet, see Productivity Improvements for the Entity Framework. The complete Movie.vb file is shown below. The MovieDBContext class you created handles the task of connecting to the database and mapping Movie objects to database records. One question you might ask, though, is how to specify which database it will connect to. 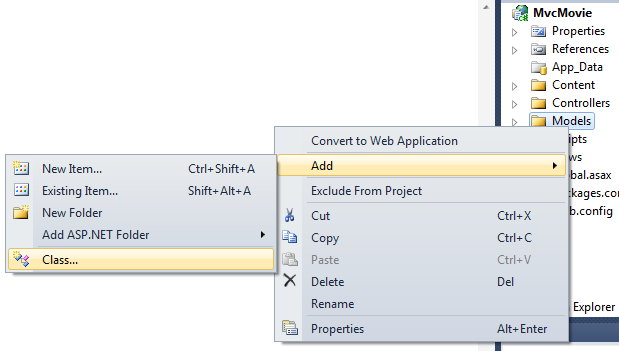 You'll do that by adding connection information in the Web.config file of the application. Open the application root Web.config file. 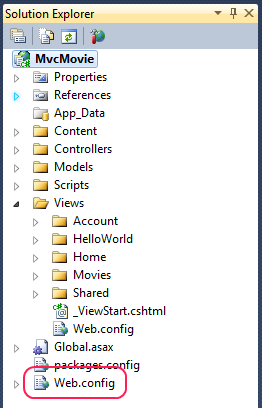 (Not the Web.config file in the Views folder.) The image below show both Web.config files; open the Web.config file circled in red. This small amount of code and XML is everything you need to write in order to represent and store the movie data in a database.